Ninja blenders are loaded with features from basic blending to food processing. Ninja has a lot of models and many of those models have accessory options or packages, so all together there’s a lot to choose from. This review sorts through them all and gives you a clear direction to choose the best model and features for what you need and what you want to spend. The tables below summarize each top Ninja blender reviewed here in a format that allows you to compare each important feature by model, so you can compare them easily. Each model also has links to Amazon if you just want to go ahead and buy your top pick. Use the table of contents below to skip to any section, including specific Ninja blenders that you’d like to read about, otherwise just keep reading. What Is The Best Ninja Blender For You? So Who Is The 4-In-1 Kitchen System Best For? Who Should Buy The Ninja Pro? Ninja Professional Countertop Blender BL660: Who’s It For? Is the Ninja BL770 For You? Nutri Ninja Pro: Who Should Buy It? What Else You Need To Know About Ninja Blenders? 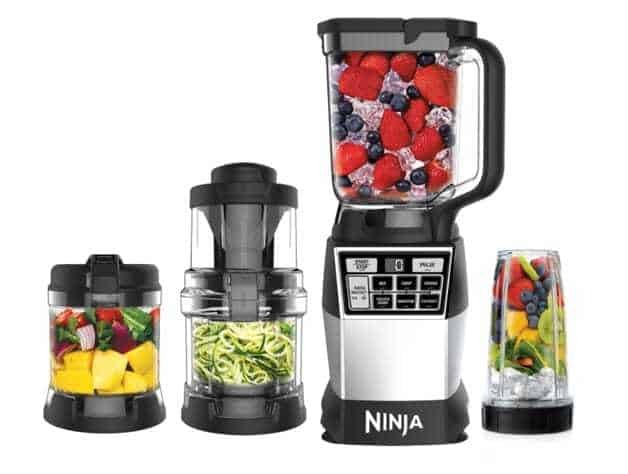 Ninja is the blender-appliance division of the SharkNinja Operating LLC group. SharkNinja was established in 1995 in Montreal, Canada. SharkNinja is now headquartered in Needham, Massachusetts. The Ninja products include countertop cookers, coffee makers and Ninja blenders and food processors, pressure cookers, slow cookers and related products. The Ninja blenders and food processors have added a lot of features since they were introduced to the market, originally in infomercials. Each model that is reviewed here is ranked in our recommended order. We describe what we like and what we don’t like about each model. We also give you a summary of each model based on what it can do for you in the kitchen and guide you to the best model for you. Ninja makes a lot of models with a lot of different features and we’ve spent over 30 hours reviewing all of them to come up with this top list. Our list includes a wide range of uses and functions, from the best single cup blender to the best blender for food processing and even why you might need a vaccum to go with your blender. The Ninja 4-In-1 Kitchen System, the AMZ012BL, includes just about everything that you can think of in a blender or even beyond. The 4-In-1 includes (1) the total crushing 72-ounce pitcher with stacked blending blades, (2) an Auto-Spiralizer with 2 spiralizing discs, (3) a 32 ounce, 3.5 cup capacity Precision Processor food processor with dough blade and chopping blade and (4) an individual single-serve High Speed Blender Cup. This 4-In-1 system is powered by a 1,200 watt motor base and Auto-iQ Technology to run various blender modes to automatically vary power settings for best results. The Ninja 4-In-1 Kitchen System is loaded with options and features, including food processing and even spiralizing. It’s a great option if you want to do a lot of different things with your blender, including blending. If you don’t need all that the 4-In-1 provides, consider one of the blender models like the BL660 reviewed here that features the same power as the blender found in the 4-In-1 but without the food processor or spiralizer or the CT805 also reviewed here that is designed to be a professional level blender without food processing. The 4-In-1 also includes the Auto-iQ system which automatically chooses the best blender speeds and blending time for the function that you choose. Customers really like how easy it is to use the spiralizer for creating zucchini “noodles” and also to use the Extract function for making their own almond milk. They also have noted that the blades are very sharp so watch them when changing out blades for different uses. Also notable, suction cups on the blender base will keep the blender from moving around your countertop while blending. See the Ninja 4-In-1 Kitchen System here in Amazon with latest pricing, any discounts and extended warranty options. The Ninja Chef CT805 is designed to be a professional quality blender with a traditional four-blade configuration at the bottom of the blender pitcher. The blender blades are designed to pull liquids and foods down into the blades to more thoroughly blend all of the ingredients in the blender pitcher. The Ninja Chef has 10 different Auto-iQ® modes. These modes are: Ice Cream, Soup, Nut Butter, Flour/Mill, Extract, Dressing, Puree, Frozen Drink, Smoothie, Dip/Salsa. You can use these modes to make your own flour and nut butters, make ice cream drinks, extract juice for juicing, make whole ingredient smoothies and mix preheated soup ingredients. 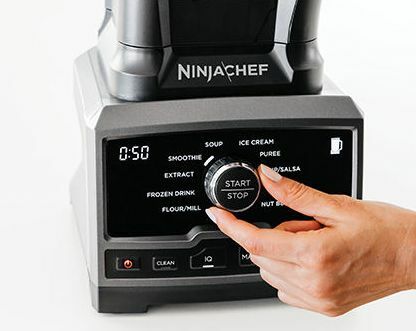 The blender motor in the Ninja Chef is 1,500 watts, which is pretty powerful and needed for tougher jobs like grinding nuts and crushing ice or other frozen ingredients. You can also use the Ninja Pro in manual mode and manually power the blender at speeds from 7,000 to 18,000 revolutions per minute. There’s also a Pulse button that will blend for as long as you press the button, a Clean button that uses the blender to blend soap and water to clean the interior. Other features include built in suction cups on the blender base to secure it from moving around while it blends. The Ninja Pro is for those who want to do more than just blend but aren’t looking for the separate food processing bowls and accessories. If want want to make your own flour by milling it or make nut butter in addition to the traditional smoothie, frozen drinks and other things, then this blender does that. If you want a basic blender look at the BL610 and the BL660 reviewed here. If you want more food processing functions look at the BL 770 and the 4-In-1 also reviewed here. 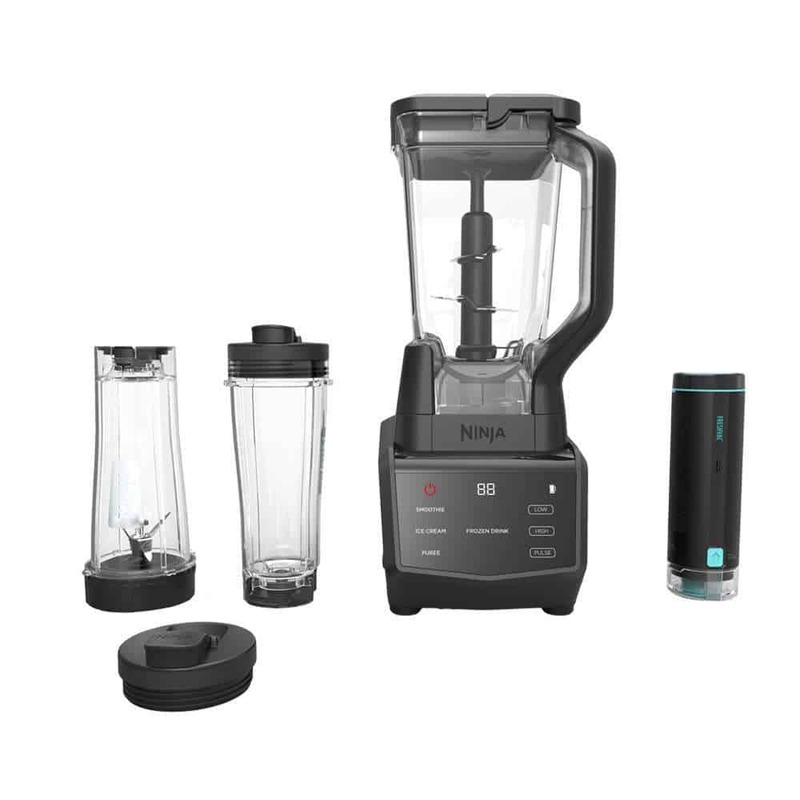 If you want single serve blending look at the Nutri Ninja Pro and if you want to try the vaccum technology built into Ninja’s newest models, look at the DUO. You can see it on Amazon here with latest pricing and extended warranty options. 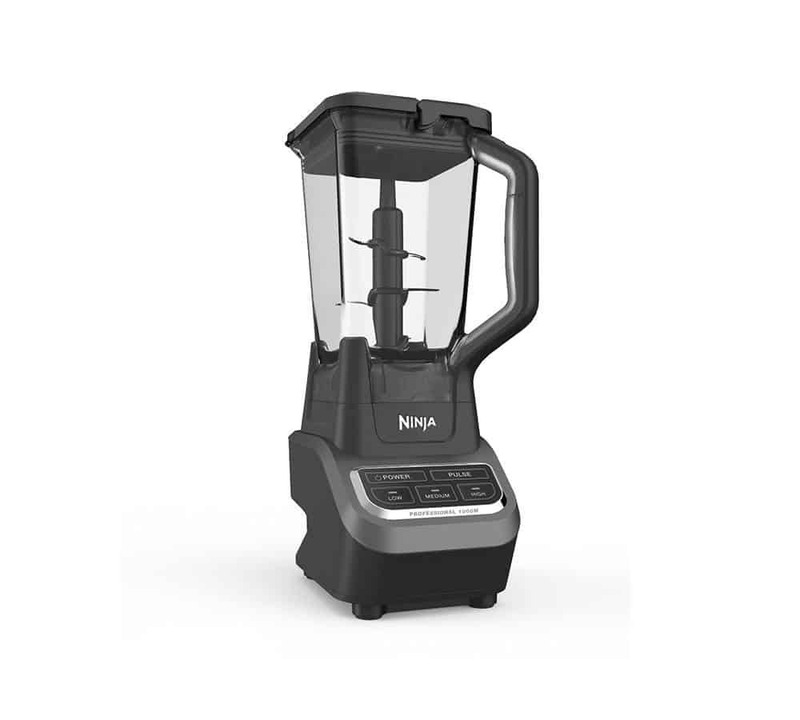 The Ninja Smart Screen CT661V is one of Ninja’s newest models, two personal blender cups and features Ninja’s “Auto-iQ” system with automatic blending modes and a “FreshVac” vacuum to remove oxygen from the blender before blending. The Auto-iQ system will recognize whether the blender pitcher jar or the personal blender cups are locked in place on the blender base and then give you options for which blender functions you want to use. Just press the right button and the Auto-iQ will do all the work of choosing the right blender speed at the right time to get the job done. When using the main blender pitcher, the Auto-iQ system gives you the choice of: Smoothie, Ice Cream, Puree or Frozen Drink, in addition to manual modes of Low, High or Pulse. When using the individual serving cups, the Auto-iQ systems gives you the choice of: Smoothie, Extract or Frozen Drink. With these modes, you can make smoothies and juices out of fresh or frozen fruits and vegetables, make ice cream, dips, sauces, margaritas, soups (from already hot ingredients) and whipped desserts. The vacuum pump attaches through lid of the large blender pitcher or the individual blender cups. After you put your blender ingredients in either type of vessel, turn on the motor and after a few seconds it will be done removing oxygen from inside the vessel. Removing oxygen keeps your blended drinks creamy without them getting frothy and, Ninja claims, will keep them fresher longer. 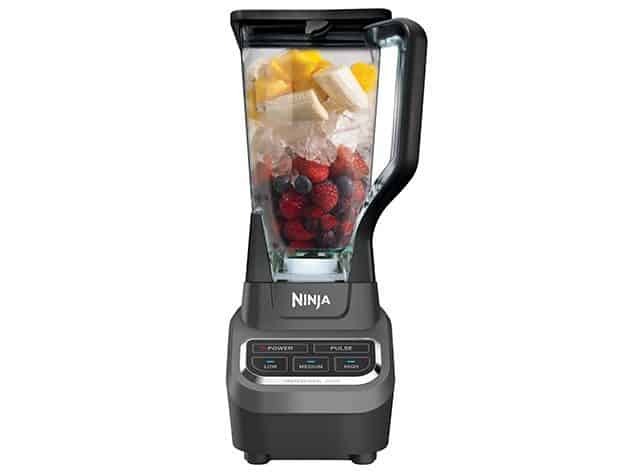 The Ninja Smart Screen DUO has a very powerful 1,400 watt blender base that is great for crushing ice and other frozen ingredients and doing it quickly. It is really a full-fledged modern drink maker. Also note tha, like many other Ninja blenders, the Smart Screen DUO has built-in suction cups on the bottom of the blender motor base to better secure the blender base and pitcher to your kitchen counter while it’s blending. 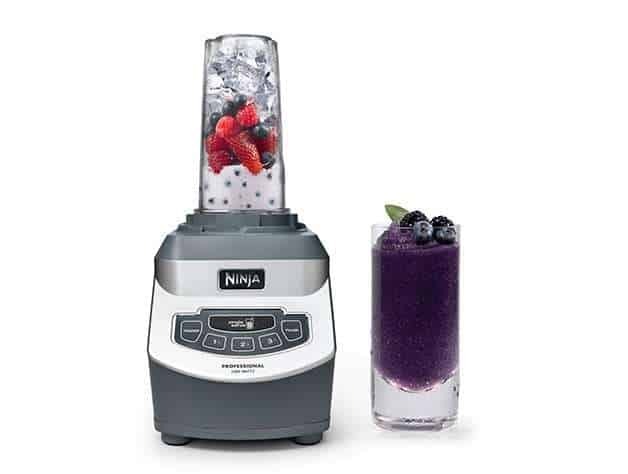 The Ninja CT661V is best for those who of you who are really, really into your drinks, whether those are fruit or vegetable smoothies, juices, cocktails or milkshakes. It also does a nice job with dips and sauces. The vacuum does reduce the froth-factor in most smoothies or drinks made without using it, and reduces it to a nice creamy consistency. You will also notice that your blended drinks stay fresher longer with the removal of extra oxygen. 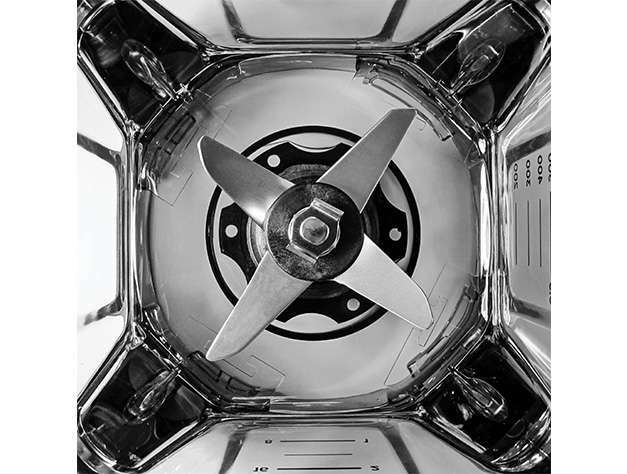 Customers have remarked that the vacuum technology does make for creamier blends that do last longer. They also like the Auto-iQ System’s automatically choosing the right blender speeds and blending time for the mode that they choose. They also like the powerful blender base motor in the DUO. If you want food processing, then look at the BL770 or the 4-In-1 Kitchen System. If you just want a basic blender then check out the BL660 or the BL610. This model is new, so there isn’t a lot of history on defects, but to be safe, you should buy an extended warranty since Ninja only provides a 1-year limited warranty. You can see the Ninja Smart Screen DUO on Amazon with latest pricing, any discounts and extended warranty options here. This basic blender is easy to use and has blades designed to crush ice, fruits and vegetables. It also has single serve blending cups for blending just one cup. The blades in the large BL660 BPA free pitcher jar are designed differently than what you will probably find in most blenders. Most blenders have a set of blades at the base of the pitcher jar. The BL660 instead has three sets of blades, their Stacked Blade System. The Stacked Blade System positions blades in three different areas on the blade assembly. Ninja does this to better blend and dice in those three areas of the blender pitcher rather than just in the base of the blender pitcher. This blender is not a juicer and does not make hot soup, it just blends, but does that pretty well. There are modes and functions for making “snow” out of ice by finely mincing ice cubes, also for grinding nuts and even hard cheeses. It will make a milkshake, gravy, puree all kinds of cooked foods and of course your favorite flavor of margarita. The individual blending cups are a great option to have if you just want to blend one cup or serving at a time, and you don’t want to use the large or main blender jar. The BL660 has two blender cups and lids for taking them with you. The BL660 is basic blender that does almost everything you probably expect in a blender, but not a lot more. If you want a full fledged food processor, use the table of contents here to find the right model for what you need to do in the kitchen. Also know that it is not a juicer but it will finely dice fruits and vegetables. For crushing ice into snow, mixing drinks, even grinding nuts, the Ninja BL 660 works well. Many satisfied customers agree that the BL660 is a great choice for a everyday blending and able to deal with dense frozen foods and ice. Remember also that it has 2 individual serving cups to blend just one cup if you want. So if you’re not looking to juice or do the full range of food processing, you should buy the BL660. Buy an extended warranty too while you’re at it. These blenders don’t always last beyond their basic warranty, which is only 1 year. Extended warranties on Amazon are pretty cheap for even 4 years and would definitely recommend buying one. To see the BL660 on Amazon with current pricing, any discounts and extended warranty options, click here. The BL770 Kitchen System is a 1,500 watt blender that includes an 8-cup food processor bowl and two 16-ounce Nutri Ninja Cups. The food processor has two blades, one for chopping and another for mixing dough. The blender pitcher has the same Stacked Blade system that is found in a lot of other Ninja models. This unique blade system is positioned in three different locations on the assembly. Each blade assembly has two blades and is designed to simultaneously blend in three separate areas of the 72 ounce pitcher jar. This system is pretty simple to operate and has worked well since it was introduced. It doesn’t have an IQ System like the 4-In-1 DUO. but that may be preferable for some. A lot of customers like the power that the base unit provides and that the food processor bowl is easier to work with than some traditional food processors. They also really like the suction cups on the bottom of the blender base that anchor it to your counter while blending. The pitcher jar lock in lid is also something that customers like. Some commented that they’d prefer to have a “chute” built into the food processor lid to feed ingredients into the bowl while it processes, like a lot of traditional food processors have. The BL770 is a powerful blender and food processor that can chop and mix dough with a blade dedicated to each function. It also provides two personal single serve blender cups. And that’s about it. It doesn’t spiralize or do other things but it does blend and process your foods reliably and is simple to use. So, if you want a powerful blender and food processor to do all of those jobs that you’d want to do for each one then the BL770 is for you. See the Nina BL770 on Amazon here with latest pricing, any discounts and extended warranty options. Each of the two cups comes with a “Sip and Seal” for taking them to go with you. 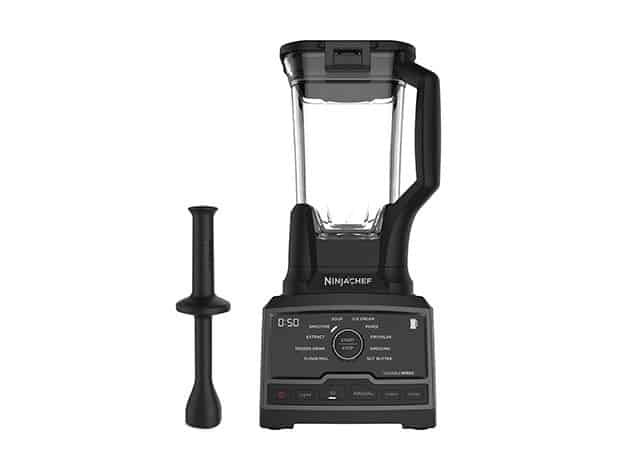 Also, the Nutra Ninja Pro blender motor is rated at 900 watts, which is a good power ratio for the size of the two blender cups. Most people are very happy with the power that the Ninja Pro brings to making fruit and vegetable smoothies, crushing seeds and for crushing ice. The Ninja Pro is designed for making single servings, so if you just want to make one cup or drink at a time instead of a whole pitcher then this is your Ninja model. If you want a full size blender, look at any other model reviewed here, from the most value oriented all the way through Ninja blenders with food processing functions. When purchasing the Nutri Ninja Pro, make sure you buy an extended warranty, since they’re fairly cheap and small appliances like these don’t always last very long. Ninja only provides a 1-year warranty, so we recommend buying the longest term warranty that you can get. You can see the Nutri Ninja Pro on Amazon here with latest pricing and warranty options. The BL610 does just about every blender job that expect a blender to do in your kitchen, including grinding nuts and crushing ice. The Ninja BL610 includes Ninja’s “Total Crushing” technology for finely grinding ice and frozen foods. The blender blade system is the same one used in many Ninja models. It is different than other blades that you might be used to. It has three sets of blades and each set has two blades. They are built into a stacked blade assembly that fits into the blender pitcher. The blades are located in three areas on the assembly, from the middle down to the bottom. Ninja uses this design to blend in three areas at the same time rather than just at the blender base like most blenders do. The Ninja blender blades are sharp, so be careful in handling them. The BL610 is really simple to use, with just three speed settings (Low, Medium and High), and a Pulse button. 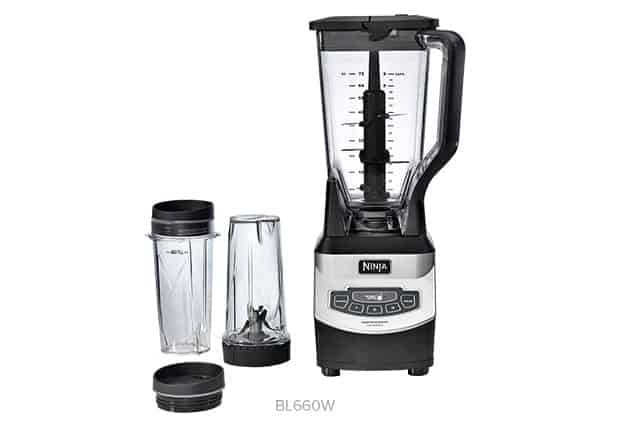 With a 1,000 watt motor base powering the 72 ounce container, the BL610 is not the most powerful Ninja model, like the 1,500 Ninja Chef 805, but has more power than you will need for most of your blender jobs. The Ninja BL610 is a cheaper option than almost any Ninja model (except the Nurti Ninja Pro single serve blender). If you want the Ninja “Total Crushing” technology and unique blade system with most of the basic blending capabilities that you expect and don’t want functions that you didn’t expect or want, then the BL610 is a good option. We recommend buying an extended warranty for the BL610, as we do for all of the Ninja blenders reviewed here. Buy as long of a warranty as you can since they are fairly cheap. See the BL610 on Amazon here with latest pricing, any discounts and extended warranty options. A lot of Ninja customers have had problems with their blenders that are usually caused by 0ver-filling their blender pitchers or other containers. If you over-fill your container, you will stress it while it’s blending at high speed. Too much liquid in the container will over-pressure it, causing it to crack or leak at the lid. So, follow the operating instructions carefully and if in doubt, under-fill your containers to make sure that your Ninja machine has enough room inside the blender to blend without stressing the container. Another related issue has to do with seals on the container lids. Make sure that the “lip” of each container lid is clean, without any build-up of debris on the edges of the lid. A clean lid with allow for a good seal on the blender. Otherwise you risk a “blowout” or the lid popping off while blending and spewing all of your blender ingredients into your kitchen. For more information about how to properly operate each Ninja blender reviewed here, read the manuals for each model, linked here for you below. 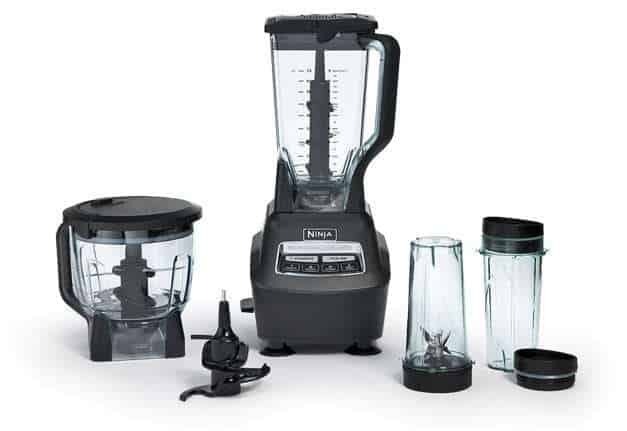 We’ve provided links to each of these Ninja’s operating manuals here in case you want to see more details about how these blenders operate, or if you just can’t find your own Ninja operating manual. For the BL660 Operating Manual, click here. For the AMZ012BL 4-In-1 Kitchen System Operating Manual, click here. For the CT661V DUO Operating Manual, click here. For the BL770 Operating Manual, click here. For the BL456 Operating Manual, click here. Tdard warranty provided by Ninja for each of the blender reviewed here is 1 year. For that reason, we definitely recommend that you buy an extended warranty. A 1-year warranty is too short for small appliances like Ninja blenders, since they don’t always last very long. Check the prices of the extended warranties provided for each model and consider the longest possible coverage. The relatively low prices of these extended warranties will most likely be worth paying for the additional protection. Ninja has a contact phone number for service (888-826-6044). They recommend registering your product before you call. Their operating hours are based on Eastern US time, and are 9 am to 9 pm Monday through Friday and they are also available on Saturday from 9 am to 6 pm. 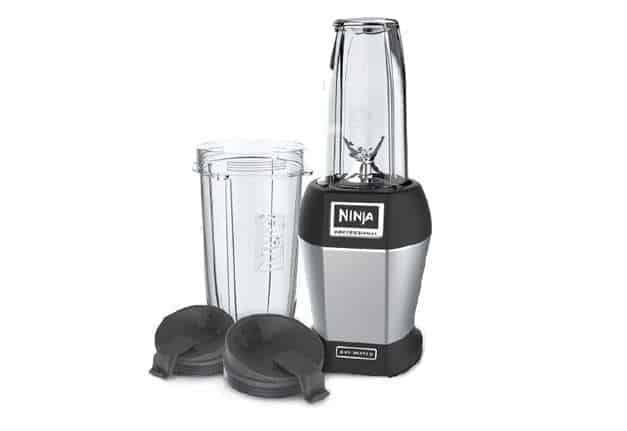 If you want to see how some Ninja blenders compare with other brands, see this review of the best blenders, and another comprehensive review of the Ninja CT682SP System and comparison with the Vitamix 750 Heritage. We also have a comprehensive review of three Nutri Ninja Pro blenders, including the BL456 reviewed here. Also reviewed, the BL455 and the BL580. If you want some healthy inspiration, here’ s short drink recipe featuring very healthy ingredients for you to test anuy of the Ninja blenders reviewed here that you end up buying.